Watermans is pleased to present Joseph Farbrook’s installation Strata-caster, an exploration of the topography of power, prestige, and position. 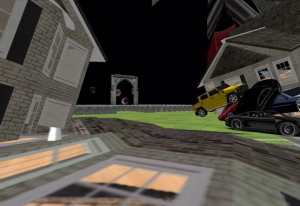 The art installation exists in the virtual world of Second Life, a place populated by over 50,000 people at any given moment. Although virtual and infinite, it continues to mirror the physical world, complete with representations of prestige and exclusivity. Entry into this installation is by wheelchair, an unfamiliar interface to the limitless expanse of virtual space, but one that continuously calls attention to limitation and position. Joseph Farbrook grew up in New York City and Santa Fe, raised by his father, a concrete poet, and his mother a painter. Farbrook creates virtual reality art installations, video sculptures, and videographs. He has also created media-reflexive live performances mixed with interactive screen projections. Farbrook's latest work explores the intersections between video, video games, and sculpture. Farbrook exhibits both nationally and internationally including SIGGRAPH2010, the AC Institute in NYC, the Museum of Contemporary Art in Denver, La Fabrica Arte Contemporaneo in Guatemala, Museo De Arte Contemporaneo in Columbia, as well as venues in the Netherlands, China, Czech Republic, and the USA. Farbrook teaches interactive media art at the Worcester Polytechnic Institute. Strata Caster Digital Art 2012 daily 12 noon - 9pm until Sunday 14th October.